"I've been held captive," Liam explains to Steffy. Check out the day-to-day spoilers and a sneak peek video below to find out what's happening on CBS soap opera The Bold and the Beautiful during the week of April 11-15, 2016. 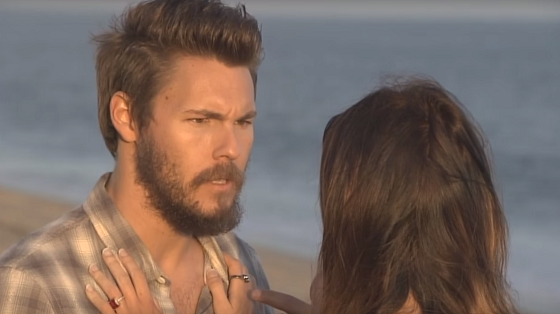 Steffy (Jacqueline MacInnes Wood) and Liam (Scott Clifton) reunite on a Malibu beach; Liam tells Steffy that Quinn (Rena Sofer) held him captive; someone unexpected frees Quinn from confinement. Having learned what Quinn did to Liam, Bill (Don Diamont) seeks her out; Wyatt (Darin Brooks) and Steffy discover Liam thinks he and Steffy are still engaged. Sasha (Felisha Cooper) tells Nicole (Reign Edwards) that she and Zende (Rome Flynn) are in love; Steffy is furious to learn Wyatt hid something from her. Katie (Heather Tom) sees Ridge fighting with a stranger in public; Brooke (Katherine Kelly Lang) and Bill stumble upon Katie's secret stash. Someone threatens to reveal Ridge (Thorsten Kaye) and Caroline's (Linsey Godfrey) secret; Katie blames her sister for her problems.